PORTLAND, Ore. (KOIN) -- Commuters will soon be able to take a ride on an all-electric TriMet bus. The agency unveiled the new buses on Tuesday morning before they went on a ceremonial first ride. The buses will be powered by 100% wind energy -- believed to be a transit industry first in the United States. TriMet teamed up with Portland General Electric for the effort to bring electric buses to the city. PGE has installed fast-charging technology at the Sunset Transit Center for the buses. 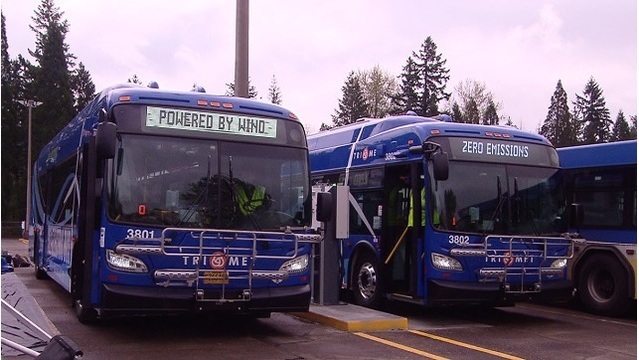 As Oregon's largest transit provider, TriMet has committed to a non-diesel bus fleet by 2040. TriMet said a standard diesel bus costs about $500,000 while an all-electric bus right now costs $1 million. But officials said they expect the cost to come down as the technology improves.